Pelado is a term invented to describe a certain class of urban bum in Mexico in the 1920s. The word means "cut hair", and refers to the custom in jails and assistance institutions to buzz-cut inmates' hair to prevent lice and other parasites. Thus, pelado becomes a catch-all reference to for low-class people. In the Carpas Theater, El Pelado is the central character, representing the Mexican national clown, a penniless underdog that embodies the popular concerns and spirit disregarded by official society. In Crosthwaite’s canvas carpa, the pelado is depicted as a Mexican migrant worker. This central figure is shown running forward through the desert holding a walking stick (a common symbol of travel) and balancing a bleached human skull over his head. This symbolizes the balance of life and death, with the inverted skull referencing life and success in one’s endeavor. He has images tattooed on his body that present the ordeals and tribulations the character has faced as he prays to the Virgin of Guadalupe for safe passage. 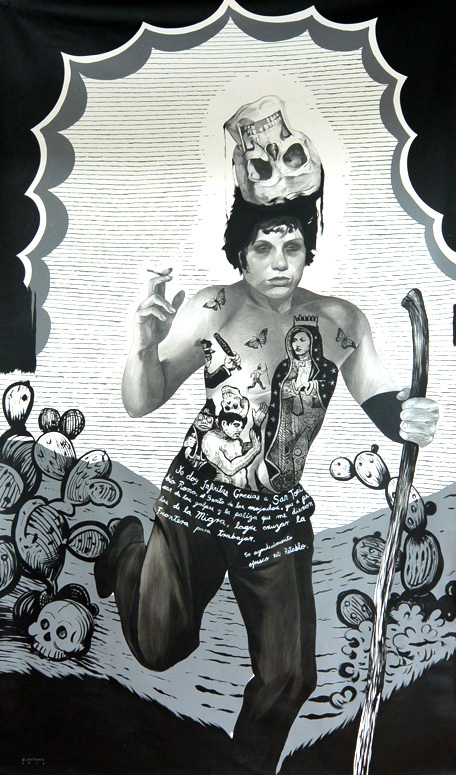 These tattooed images mirror Mexican retablo paintings, devotional images painted on tin in gratitude for miracles. The writing on the figure translates as: “I give infinite thanks to San Toribio Romo, patron saint of wetbacks, that besides the blows and beatings that I received from the Migra, I was able to cross the border to go to work. In gratitude I offer this retablo.” Thus, the aesthetic of this piece mirrors that of the old printed religious stamp, featuring a Catholic saint or martyr. Like a modern day pelado, the migrant worker, with great bravery and wit, travels long distances, survives and overcomes great dangers, and in so doing exposes the corruption of unjust and immoral laws.